The title character here, played by Adam Driver, takes pride in the fact he shares the same name as the town he lives. This kind of peculiarity reflects the film as a whole; it’s oddly charming but not exactly memorable. Paterson takes pride in his job driving the local bus route and in the mornings he crafts poems based on his daily experiences and observations. Think of Jim Jarmusch’s latest as the white, middle-class alternative to Fruitvale Station. The slow-burning structure is akin, following the day-to-day life of its male protagonist, but without really packing the same punch. Sure, the lead characters here have their struggles but not the type that’ll get you emotionally invested. Driver, much like his performance in Girls, shows moments of brilliance – mostly in the subtle ticks and expressions that feel ad-libbed. 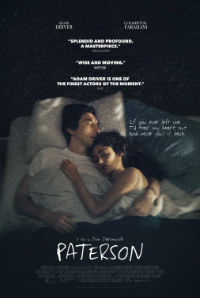 He and Jarmusch do well to make Paterson’s thought processes, especially while writing poetry, somewhat interesting considering he’s just staring blankly at a pad. His girlfriend Laura, played by Golshifteh Farahani, is compelling but never really fleshed out properly. On one hand it’s easy to see why Paterson is attracted to her free-spirited and entrepreneurial nature, yet it’s never really explained why she doesn’t have a job of her own. While it’s clear she loves him, it’s hard not to wonder whether she’s really taking advantage or that he’s somewhat blinded by her beauty. Their relationship could have been explored further instead of some unnecessary sub-plots and throwaway characters that are included. What’s perhaps most disappointing is that for a film about the poetry of life, there’s nothing really insightful or moving about it. The dialogue should have flowed seamlessly with each line, but instead the structure feels clumsy and ultimately it falls flat.